The vacant lot that DEP is refusing to build a park on is already overgrown with weeds and gathering trash. WEST VILLAGE — The city is reneging on a decades-old promise to provide Greenwich Village and SoHo residents with three new public parks while insisting on building affordable housing on a beloved neighborhood garden, DNAinfo New York has learned. 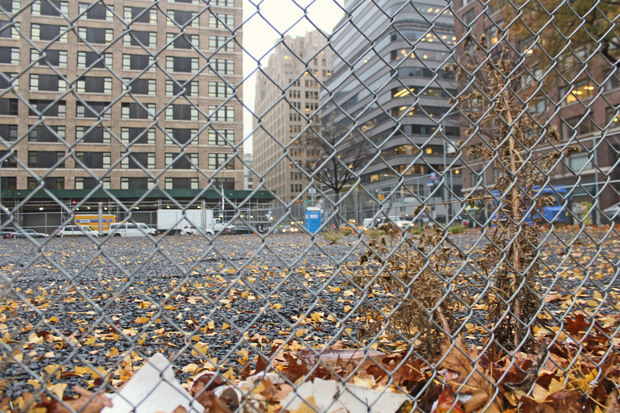 Three large construction sites — at Houston and Hudson streets, on East 4th Street and at Lafayette and Grand streets — that are home to shafts connected to the city's massive underground drinking water tunnel project were supposed to be eventually become public parks under agreements struck in the late 1990s. The Department of Environmental Protection promised back then to turn over the land for the parks during the public land-use review process, known as ULURP. But now the city is telling the local community board they're not getting their parks when the project concludes, with no real explanation, Community Board 2 chair Tobi Bergman said. "This is what's called arbitrary and capricious," Bergman said. "Government cannot make a process that includes public review, community boards, the borough president and the City Council, and then the agency reverses it without so much as a comment, just by announcing it." Most frustrating of all, Bergman said, the DEP just wants to leave the lots vacant and erect a high fence around them. Vacant lots create blight and make neighborhoods less safe, he said. "There's nothing more destructive to the neighborhood than a permanent vacant lot with a high fence around it," Bergman said. "If someone had said that ultimately that was going to be the appearance of these community sites, there would have been vigorous community opposition." The parks issue was raised when the board ramped up its fight against the city's push to raze the Elizabeth Street Garden, a neighborhood gathering place beloved by many, and build affordable senior housing on top of it. Because the land the DEP is using for the shafts was private property before the city "acquired" it, the ULURP process was required. ULURP documents reviewed by DNAinfo New York show the community board and the Manhattan Borough President at that time, C. Virginia Fields, gave their approval for the DEP projects only if the sites are turned into public open space for the community. The 1999 City Planning Commission report approving the first and largest site, on Hudson and Houston streets, includes a promise from DEP to turn the lot over to the Parks Department once construction finishes. "Due to the significant interest by the community and the Department of Parks and Recreation in having the site become open space/parkland after construction, the applicants have committed to converting the site into a public park after completion of the shaft project," the report said. Bergman, who was involved in the negotiations back then, said there was actually a smaller site on Leroy Street that was available to DEP, but the agency opted for this larger site, with the community's approval, because the Parks Department expressed an interest in having it officially mapped as parkland. "It's just a total collapse of legitimate process and a reneging of commitment," Bergman said. Bergman said when the agency first said the areas had to be closed off to the public, they blamed it on 9/11. "When that obviously wasn't the case, because many of the sites are on the street level with cars parked right next to it, they changed and said it was for maintenance reasons," Bergman said. The agency had long said it would need need "a drivable surface with no obstructions" for monthly maintenance checks on the shaft, Bergman said, but "never said that it was exclusive for them." Bergman pointed out that one of their finished shaft sites already has been turned into a public sitting area by the Holland Tunnel exit ramp, with "no means of security [and] no special access requirements." The two other site acquisitions were approved by the City Planning Commission in 2001 and 2003. According to a 2003 commission report for the Lafayette and Grand streets site, two DEP officials said at a public meeting that the agency could either craft a memorandum of understanding with a community group that would develop the site for open space, or could transfer the space to the Parks Department. “In this instance, DEP intends to acquire the site and work with a community group following completion of construction so it may eventually be used as open space,” the report reads. DEP committed to contributing at least $400,000 to the “Percent for Art” Program, administered by the Department of Cultural Affairs. “The ‘Percent for Art’ Program has been used previously to fund artist who develop community gardens as art and it is possible that a similar arrangement could be the set up for Shaft 30B," the CPC report says. But it appears the City Planning Commission never actually held DEP to those promises at either of these sites. Both commission reports end with DEP letters that said while the agency supported forming a committee to discuss future plans for the site it would not commit to the parks "to avoid any future potential problems that could arise." DEP did not respond to inquiries from DNAinfo New York for more than three months, but after City Hall officials intervened, a spokesman, who refused to be named, said, "DEP is involved in ongoing discussions with the community board and the council members regarding the future use of the three water tunnel shaft sites." Bergman said the agency is trying to meet with the board regarding the sites' fences because they'll need the approval of the Public Design Commission, which generally takes input from the board, to proceed. CB 2 is refusing to meet with the agency until the board meets on the issue. "I like the guys, I think they work hard, I think what they've done is an astounding accomplishment," said Rich Caccapolo, the chair of CB 2's Parks Committee, speaking of the DEP's work on the water tunnels. "We just want to make sure that the most accessible space is best used for the community."